The perfect hardware bundles to pair with your PayPal Cash for Registers system. These bundles quickly and easily integrate with PayPal Here and supported mobile point of sale software from Vend and ShopKeep. Everything you need to start processing payments today! Premium Bundle for iOS, Complete iOS Hardware Bundle. Includes PayPal Card Reader, Star TSP143LAN futurePRNT Thermal Receipt Printer, Heckler C series Apple iPad Stand, CradlePoint MBR95 Router, APG Vasario Series Cash Drawer, Drawer Mount, Cables, and 6 rolls of Receipt Paper - Apple iPad not included. FREE Ground Shipping to Continental US. Standard Bundle, Complete Hardware Bundle. 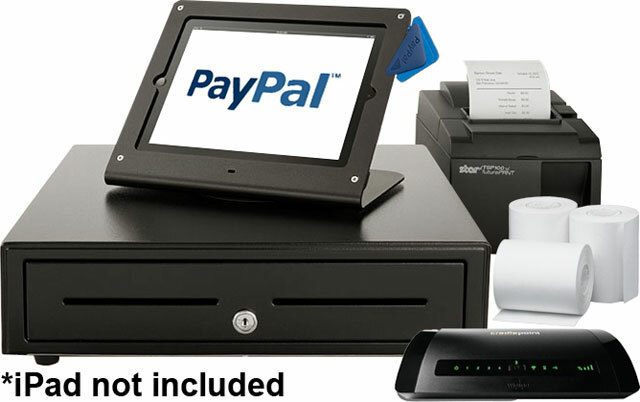 Includes PayPal Card Reader, Star TSP143LAN futurePRNT Thermal Receipt Printer, Heckler C series Apple iPad Stand, APG Vasario Series Cash Drawer, Drawer Mount, Cables, and 6 rolls of Receipt Paper - Apple iPad not included. FREE Ground Shipping to Continental US. Basic Bundle for iOS, Complete iOS Hardware Bundle. Includes PayPal Card Reader, Star TSP143LAN futurePRNT Thermal Receipt Printer, APG Vasario Series Cash Drawer with till, Drawer Mount, Cables, and 6 rolls of Receipt Paper - Apple iPad not included. FREE Ground Shipping to Continental US.